So the photography on this recipe is not the greatest (I took the picture with my iPhone). BUT- I could not resist a quick picture so that I could share these pork chops with you guys! 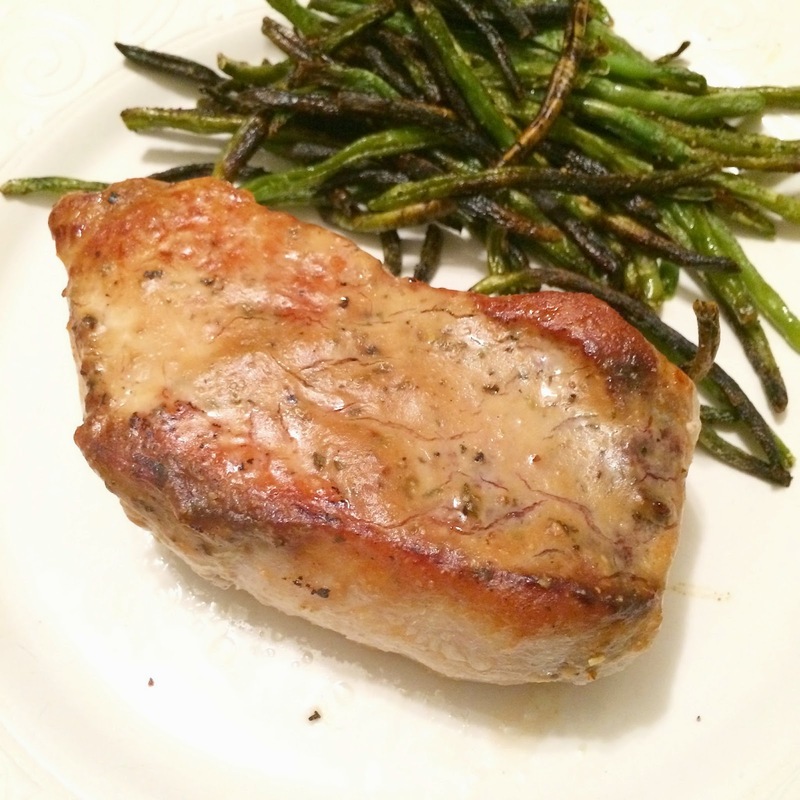 The recipe is similar to my Perfect Pork Chops post, which has become pretty popular here on my blog. This one adds a burst of flavor by glazing the meat before it's popped into the oven. I love the taste of honey mustard, but am often disappointed with the extra sweeteners and additives in prepackaged bottles. So, I mixed up my favorite simple Dijon mustard from Whole Foods' 365 Organic brand with pure honey I had on hand, and created my own perfectly sweetened glaze. The addition of Italian seasoning, garlic, and a little salt & pepper just ups the flavor of the glaze, and perfectly compliments the light sweet notes of the pork. Whether you're a pork fan or not, pick up some pork chops next time you're out- and give this recipe a try! It has become a huge favorite for me. In a small bowl, combine the Dijon mustard, honey, and spices. Heat your cooking fat of choice (I like avocado oil) in a large skillet over medium to medium high heat. Add the pork chops, and cook for 2-3 minutes on each side to sear the meat. Transfer the pork chops to a baking dish lined with foil, and brush each piece of meat with the honey Dijon mixture. Bake at 425ºF for 15 minutes, or until juices run clear. Allow the pork chops to rest for a couple of minutes before serving.